For many years Bullards Bar had some of the smallest kokanee in California. This was because of the large, naturally spawning population. There were too many kokanee in the reservoir and they were competing for the same food source. Fortunately, the fishery has improved in recent years. Bullards is a place to kokanee fish again, and a popular one. Even on a Monday or Tuesday there will be 30-40 boats targeting kokanee. On weekends there’s many more. Why did the lake go from bust to boom? The kokanee went from being 10-inches max only a few years ago to having 16-inch fish already this year. It depends on how much plankton is left in the left, but I expect to see a solid 17-inch fish this summer. The average fish is running 10-14 inches, which is almost a third larger than it was a few years ago. I think the turnaround is a reflection of increased limits. There used to be too many kokanee in the reservoir. When they implemented the 10-fish limit (instead of five) a few years ago the size of our kokanee started increasing. It’s been getting better each year. We’ve had a great kokanee bite on Bullards this summer. It’s been limit style fishing. Most boats have been hammering them. This bite should go until early September. There’s no signs of them spawning yet. The best time to fish is from sunup till noon during the week. On the weekend the start time is the same, but you have to be off the water by 10 am because there’s too much boat traffic. I’ve been launching at Dark Day Boat Ramp and fishing Garden Point, the mouth of the Yuba, Tracker Cove and then from Moran Cove to Dark Bay. The kokes are running about 50-70 feet deep right now. They’ll go deeper as the summer progresses. When they school up at the dam later in summer they’ll be 70 to 140 feet deep, but we aren’t there yet. I’ve been using a lot of 4.25 inch Rocky Mountain dodgers in pink, orange and chartreuse and trolling anything small behind it, like a Pink Plankton Squid, pink hoochies or a red Radical Glow tube. I’ve been using Natural Fire Corn and adding tuna oil from a tuna fish can, but any color of corn will work. Editor’s Note: Troy Barr operates T-Roy’s Guide Service. 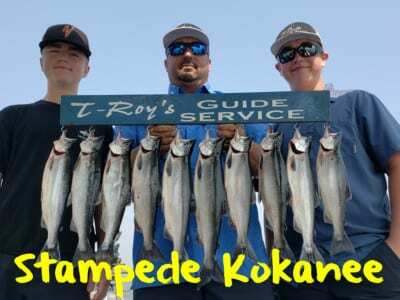 For more info on his guided Bullards Bar kokanee trips please visit http://www.fisht-roys.com or https://www.facebook.com/TRoysGuideService/.